Millions of children around the world grow hungrier every day. And the United States is no different. According to the Department of Agriculture (USDA), 15.8 million children under the age of 18 live in households across the 50 states where they are unable to consistently access enough nutritious food necessary for a healthy life. So when we discovered a great grandmother from Washington state who is trying to lower those numbers, we just had to share her story. Phyllis Shaughnessy lives in the Gray’s Harbor school district, which is a run-down town with low income families and no available work nearby for the people who desperately need it. And the children are the ones who end up suffering the most. During the school year, the township’s children are fed through the school’s lunch program. But when summer arrives, that lunch aid comes to a grinding halt. 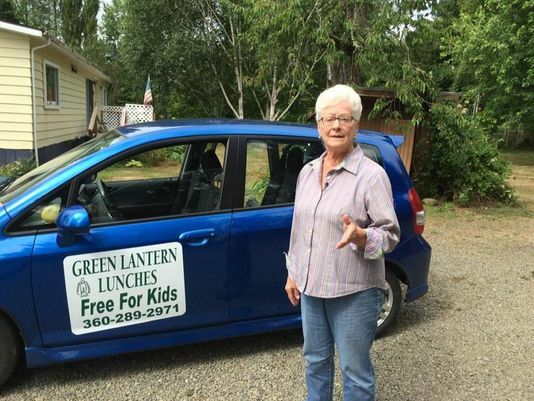 So when Shaughnessy learned about all the kids in her county that could go hungry over the summer, she decided to help feed ALL 200 of them — every single day. Though summer is now over with most kids back in school, Shaughnessy still plans to remain active during the school year, helping them with school supplies while also delivering meals on the weekends and holidays. “You’re offering the children hope and love and a lunch,” Shaughnessy said in an interview with KING News. To donate to the group’s GoFundMe, click here. This is absolutely terrific. Kudos to her. How inspiring. Wonderful person. If we could all be like her, the world would be a much better place. She is a true giver in every respect. What a blessing she is to the kids and the community. “You must be the change you wish to see in the world.” Some people complain, some people speculate and some people do. This is a story of a doer. So uplifting. In today’s world, it’s stories like this that give me hope the world is still good. Thanks for sharing her story.